Alas, our stunning Allium “Beau Regard” are now past their best. Their magnificent colur has faded, and the bees have stopped visitng. I didn’t want to cut them off in their prime, nor deny the bees their share of the beautuful blooms. Anyway, I don’t want to save them for their colour – I want to have them as Christmas ornaments (am I mad, thinking about Christmas in July?). So, now, our four faded beauties are in the hallway, at the foot of the stairs…. 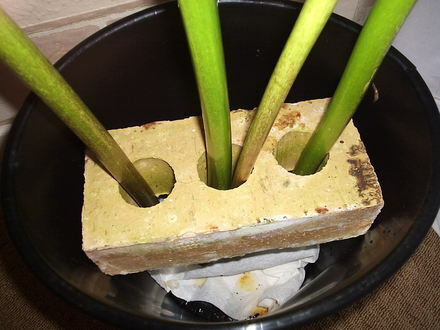 …..standing in a large flowerpot with absorbent kitchen paper in the bottom, to soak up the sap………………..
……….and a brick wedged halfway down, to keep the alliums upright. If I had done this with the flowerheads in full colour, I would probably have foregone the kitchen paper and put the stems in a couple of inches of water. When all the water has evaporated, the flowers are dry enough to use. Alliums, I find, prefer to dry out upright, like hydrangea. After only a few days, the stems are now taking on the ruddy hue of rhubarb stalks, so I know that they are beginning to dry out. Question:- How do you dry yours? This was so helpful, I have never done this before, but will do it 4 sure from now on. Greaaaat idea. thx. I have just been out and cut off the stem off my mine and it seems hollow already~but it has two green seeds on it~should I take them off now or wait? Arlene, am presuming your allium head is still purple, apart from those 2 green seeds? I would just remove these now, as they are not going to do much, they'll just turn brown and show up as imperfections. Not sure if they could be ripened and produce viable seed? You're welcome, Doon. This is something my Mum used to do with hers. She would spraypaint the globes in either, silver, gold or copper as Christmas colour. With the smaller ones, you can cut off the flowerhead with a short length of stalk after painting, thread through some gold thread, and hang them like baubles on the Christmas tree! 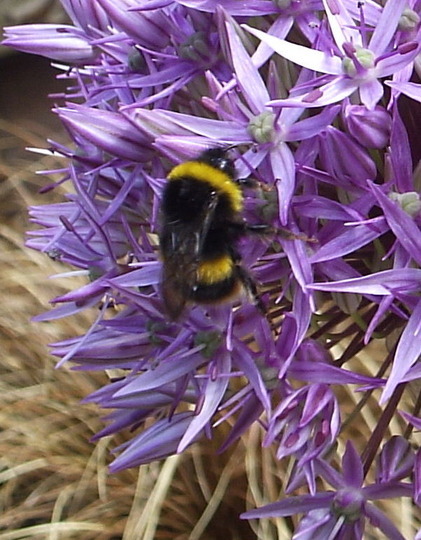 ~it's an Allium Christophii and is very dried out apart from the two large seeds!Any chance thay could be viable? I'm no expert, lol, but have tried in the past with seedpods removed from cut poppies. I put the pods in a paper bag and left them to turn brown. I got a few ripe seeds. Having said this, remember my Amaryllis? I picked off the large green seed pods, but left them lying on a windowsill. They turned brown alright, but then disintegrated into mush. Allium seedpods should really be left on the plant in the garden to ripen before collecting - but, I think it's not going to hurt to try, is it? You're going to have to remove them in any case, should they turn mushy and cause fungal disease, which would ruin your lovely A. christophii heads, which will look stunning during the Festive Season. You should have left the Amaryllis seed pots on the bulbs till they went brown & began to split open. Most seeds will only ripen & be viable if you leave them on the plant. 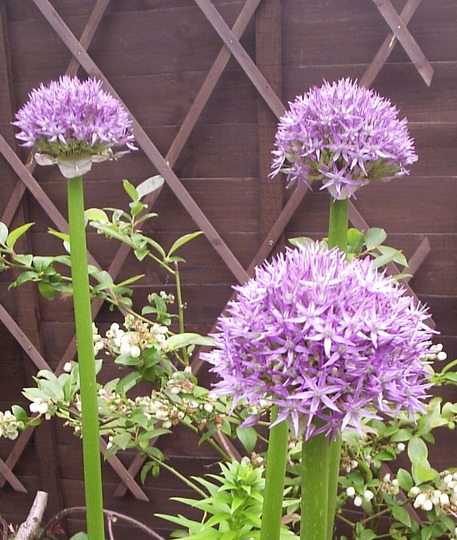 I have never grown these big Alliums, only Allium Mollis, the little yellow ones. Though I did have a few white ones come up this spring. I seem to remember planting some in the autumn of 2007. I have no idea what they are called. I probably bought some small bulbs that autumn to put in the pots with the Pansies. I usually underplant with Crocuses as they flower long before the Pansies & then they hide their dying leaves. 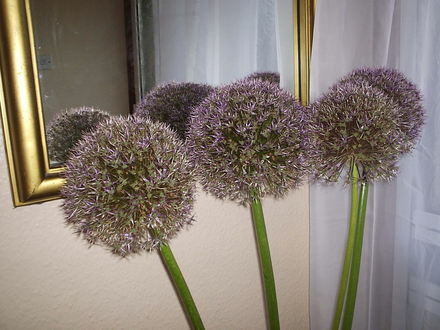 Hi, my neighbour gifted me some dried alliums - she leaves them to dry on the plant itself and once they have lost all colour and the stems are brown, she cuts them. She also sprays them with colour for christmas decorations. So so very clever of you. I want to go out and search for all kinds of allium now. Great piccies too.